Sterling Style: Fall is that you? As I have been saying over and over, it's hot and majorly hot! The other day it was in the triple digits here in the bay. However, today I really felt the first feeling of fall. It was in the 60's and cold and windy. I immediately wanted to grab a cup of tea and snuggle by the fire. It still is not cold enough to really pack on the clothes so I threw on some cozy items that still allowed me to keep cool. 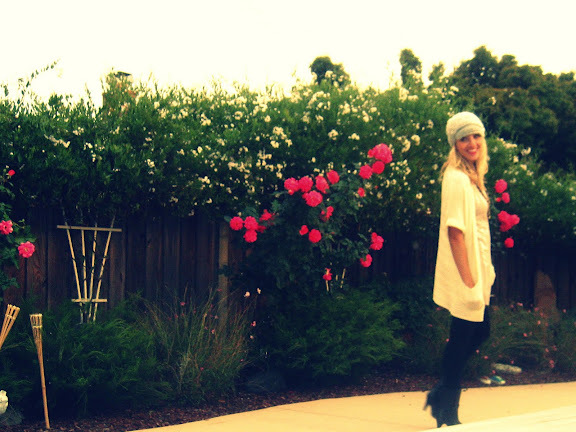 I love wearing hats (best way to hide my rat's nest hair) and this knit cap from Anthropologie is one of my favorites! A lot of you have been asking about the lighting in my pictures. I would love to have a nice SLR camera and one day I will, but I use Picnik to edit my lighting and exposure. It is an awesome photo site. Check it out! Oh wow this is such a gorgeous outfit, i love your beanie and yellow bag! Yes the weather is so much better nowadays where we live, you can feel the wind on your face and i can't wait for winter! pretty look, and what great photo quality you got from this site! YOU LOOK LIKE A 1920'S BEAUTY! SO LOVELY! I love Picnik... that is where I edit all my pictures for my blog too. I only have a little point and shoot camera so I love the option Picnik gives you to make your photos better. I hear you too... one day I hope for a great SLR camera as well. Love this outfit on you!! You always look so amazing. That hat is adorable!! 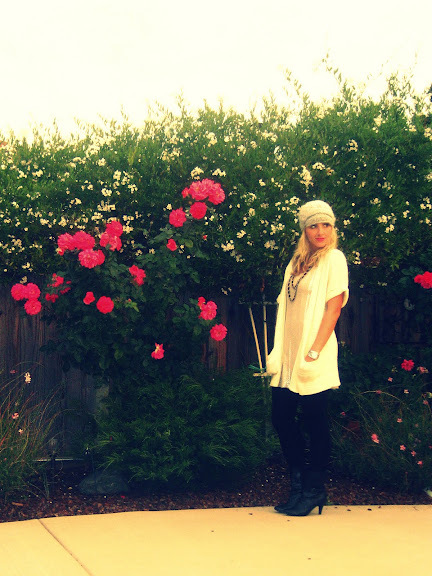 You look so adorable in your knit cap and with gorgeous flowers in your background! I pretty much complain about the heat on a daily basis! That dress is so fab! Very pretty, i like your hat! I love the proportions of this outfit! fall is my favorite season and I'm happy that I get to break out the big sweaters again. wow, what great photos and lovely look. what app do you use in picnik? Those boots are my fav part of your outfit, and they are thrifted, amazing! that hat is so cozy! our temperatures dipped down to the 60s this morning and you better believe I took advantage and threw my boots on! You found fall?? I wish it was hitting Florida already. I was at the beach today catching some rays, and evidently I fell asleep and got a bit burnt. Anyhow, I have all my fall clothes ready to roll, I just need the cool weather to hit!! I love your outfit! yeah, I think fall is almoust here...although here in Spain the temperatures are as summer! The colors are so awesome + you are rocking the beanie! I love the hat on you. And love using Picnik, too! You look so mischievous in the last photo - love it!